From Goodreads: In the far future, people no longer know what to believe...Did Kyle Straker ever exist? Or were his prophecies of human upgrades nothing more than a hoax? Peter Vincent is nearly 16, and has never thought about the things that Strakerites believe. His father — David Vincent, creator of the artificial bees that saved the world's crops — made sure of that. When the Strakerites pronounce that another upgrade is imminent, Peter starts to uncover a conspiracy amongst the leaders of the establishment, a conspiracy that puts him into direct conflict with his father. But it's not a good idea to pick a fight with someone who controls all the artificial bees in the world. 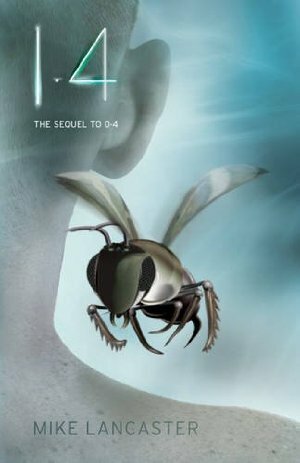 1.4 is the next book in the Point 4 series but it could easily be read on its own as a standalone. It's clever, kind of creepy and definitely a book I would recommend! Mike Lancaster has a really assessable style of writing which drew me straight into the story. Despite the 'futuristic' nature of the book I still completely identified with the characters - I was bit worried at first I wouldn't. But I really liked Peter and Alpha and love the way they fight for what they think is important. Again, as with 0.4, I'm finding it hard to know what to say without giving away too many spoilers. Those of you who have read O.4 will have a good idea what to expect with this one - it has a very similar vibe to 0.4. I wasn't sure the author would be able to match the first story's intensity but he does. The ideas behind this one are really clever and I really enjoyed the way it all unfolds. Completely compelling - this is the perfect blend of science fiction and thriller. I can't wait to read more by this author!